(Syracuse) - Nassau County Assemblyman Thomas DiNapoli (D, 16th District), chairman of the Environmental Conservation Committee made his first visit to New York’s only college for environmental science Thursday, September 1. During a visit to Syracuse, Assemblyman DiNapoli accepted an invitation from Syracuse Assemblyman William Magnarelli (D, 120 District) to tour the SUNY-ESF campus where he met with President Cornelius B. Murphy, Jr. for an overview of college projects. Dr. Timothy Volk briefed Chairman DiNapoli on ESF’s development of willow as a renewable energy resource. He also met with Dr. Thomas Amidon who explained SUNY-ESF’s environmentally safe sugar from wood extraction process to produce ethanol, plastics and platform chemicals, while Dr. James Nakas demonstrated his applied research that makes wood a source for biodegradable plastics and production of hydrogen. 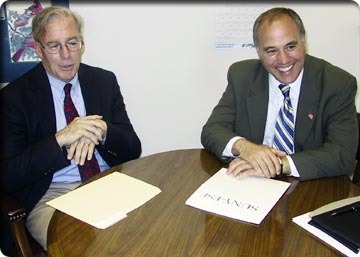 “I certainly heard a lot about ESF over the years but to see it up close and have the chance to talk with some of the students and faculty certainly shows that the great reputation is well deserved,” said Assemblyman DiNapoli, a member of the Assembly representing northwestern Nassau County since 1986. “My colleague Assemblyman Bill Magnarelli has been a wonderful champion of what you are doing here and I’m glad I followed through on his invitation on your behalf,” explained DiNapoli. Assemblyman DiNapoli also serves as Co-Chair of the Legislative Commission on Water Resource Needs of New York State and Long Island.